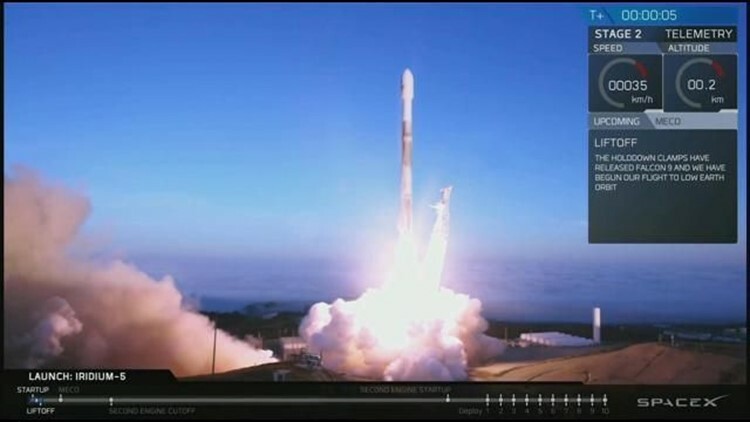 VANDENBERG AIR FORCE BASE, Calif. (AP) — A SpaceX Falcon 9 rocket carrying 10 satellites for Iridium Communications has blasted off from Vandenberg Air Force Base, California. The rocket lifted off at 7:13 a.m. Friday and arced over the Pacific west of Los Angeles. The satellites are expected to be deployed into low Earth orbit about an hour after liftoff. The Falcon 9's first stage was previously launched on an Iridium mission last October and was recovered. The payload is the fifth set of 10 new satellites launched for Iridium, which is replacing its entire global satellite network. The $3 billion project is scheduled for completion this year, with a total of 75 new satellites in orbit. Iridium, based in McLean, Virginia, provides mobile voice and data communications.